← Okra – what’s not to like? 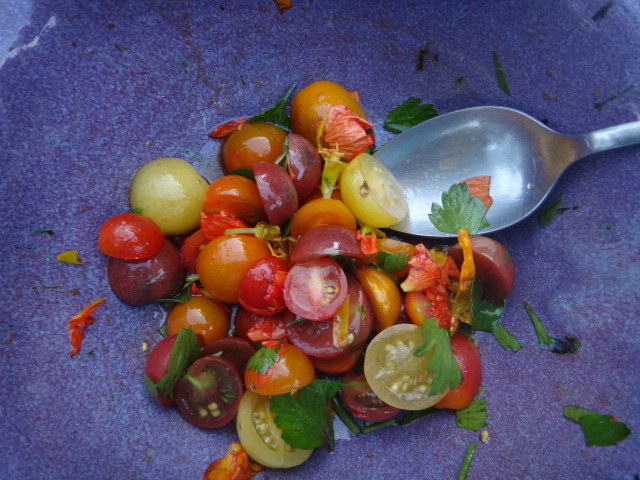 Hummingbirds and ancient bees are responsible for the color and shape of nasturtium blossoms and have a unique view of them, explains Jeanne over salad. Fall frost hasn’t yet claimed our nasturtiums (Tropaeolum majus; Tropaeolaceae family). 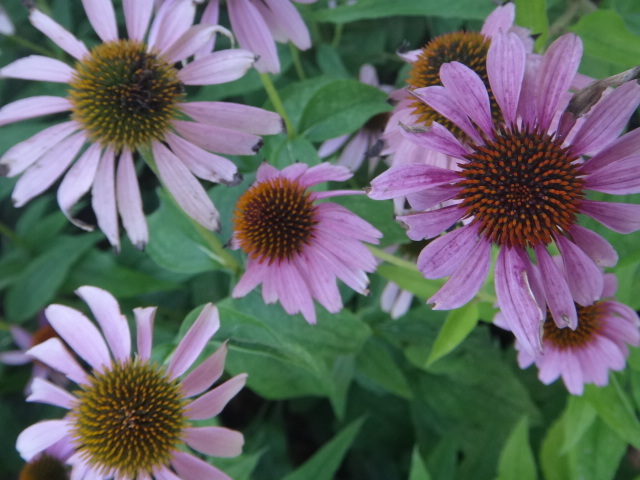 The large, colorful blooms amidst the round leaves are still spilling over planting boxes. All parts of the plant are edible and boast spicy mustard oil glucosinolates, betraying the plant’s membership in the order Brassicales, along with the cruciferous vegetables and mustard in the Brassicaceae family, capers (Capparaceae), and papaya (Caricaceae; try the seeds, as suggested here). I’ve heard that the immature flower buds and immature seed pods can be pickled like capers, but I haven’t tried it yet. Mostly I use the flowers, throwing a few in a salad or chopping them coarsely with other herbs and stirring them into strained yogurt or butter to put on top of roasted vegetables or lentils. In addition to the mustardy kick, the sweet flower nectar adds to these dishes. The nectar is located in the conspicuous long spur descending from the receptacle, the base of the flower that supports the sepals, petals, and reproductive organs (Decraene and Smets 2001). 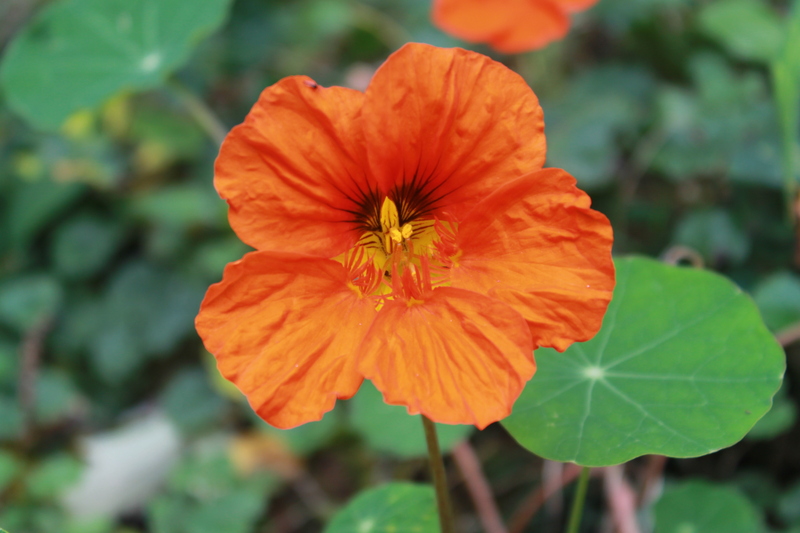 It turns out nasturtium nectar is exceptionally sweet: its sugar is especially concentrated and consists mostly of sucrose, instead of the fructose and glucose in nectars of most species. For the sweet nectar, handsome spur, bright yellow-to-red colors, and large flowers, we can thank hummingbirds, the main pollinator of nasturtiums. Hummingbirds typically visit a much narrower range of flowers than do bees or butterflies, so catering to hummingbirds means that the pollen of a relatively small number of species will fall from a hummingbird’s body onto a nasturtium stigma, increasing the chances that pollen from another nasturtium plant will land there. 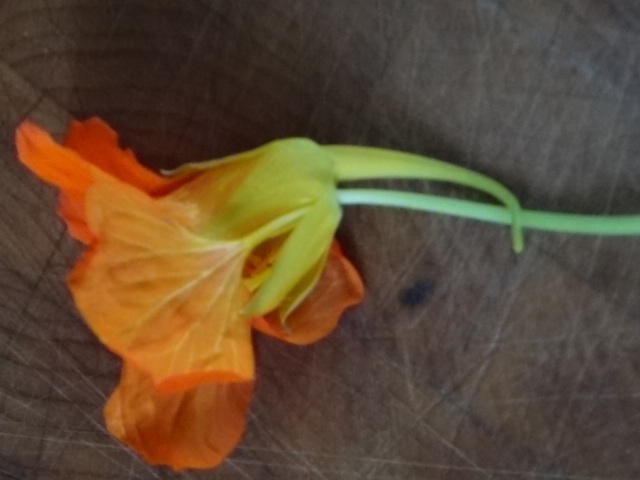 Even among hummingbird-pollinated flowers, nasturtium nectar is especially sweet (Hainsworth and Wolf 1976). The nectar hidden in the long spur is only accessible to animals with tongues or proboscises long enough to reach it, another mechanism to favor hummingbirds and winnow down the pollinator field. Hummingbirds perceive red better than bees do and respond to bright colors and large floral displays. For the beautiful striped pattern at the center of the flower and bilateral symmetry of nasturtium flowers, however, we can likely thank ancient bees. Sunflowers (Asteraceae) are radially symmetrical, or actinomorphic. Any line that passes through the center of the flower splits it into two equal mirror-images of one another. Like snapdragons (Scrophulariaceae), basil (Lamiaceae), and pea (Fabaceae) flowers, however, nasturtium flowers are bilaterally symmetrical, or zygomorphic. Only the vertical line passing through the center from top to bottom splits the flower into equal halves. Orange nasturtium. Dark nectar guide stripes visible on upper petals. Photo by T. Wesiger. Both zygomorphy and the petal stripes, called nectar guides, are adaptations to assist pollinators. Zygomorphy evolved numerous times in disparate plant lineages, from radially-symmetric ancestors, in response to behavior of pollinators, especially bees (Citerne et al. 2010, Neal et al. 1998). Bird pollination likely evolved from bee pollination, so many species predominantly pollinated by birds are zygomorphic. Zygomorphy may improve plant reproductive success by improving the efficiency of pollination by bees (and maybe other insects that pollinate during the day) and birds. The vertical orientation of the flowers matches the plane of approach of flying visitors, and for bees especially, the lower lip of zygomorphic flowers may serve as a convenient landing pad. There is usually only one narrowly-specified location for a pollinator to sit in order to access nectar from zygomorphic flowers, which allows the flower to more precisely match the contact points of pollen-bearing anthers and pollen-collecting stigmas to the pollinator’s body as it collects nectar (and/or pollen). Zygomorphic flowers also may present a more complex visual search image for pollinators, which may encourage pollinator fidelity to a particular plant species, which increases the chance that pollen from different individuals of the same species will make its way around a population (Neal et al. 1998). The upper and lower lobes of some zygomorphic flowers (like in a snapdragon—Antirrhinum) may be pressed together such that only very strong, large bees can weigh down the lower half of the flower, revealing the nectar. This limits the range of possible pollinators capable of visiting those flowers and is another mechanism to increase the chance that any particular pollinator visitor will carry pollen from the same species. Yellow coneflower (Asteraceae) as seen by us in visible light, under UV light, and a composite “bee view” image. Image copyright Dr. Klaus Schmitt, Weinheim, Germany. Zygomorphic flowers typically have conspicuous nectar guides visible to us (humans) as well as animal pollinators: lines and/or dots or color differentiation leading in towards the flower center, where the nectar is. Nectar guides may help animal pollinators, especially bees (Anderson 1977), identify appropriate flowers and quickly position themselves to collect nectar and perform the pollen transfer. Many flowers also have nectar guides that are only visible under ultraviolet light, making them visible to insect and bird pollinators, but not to us (Osorio and Vorobyev 2008). Captured by special ultraviolet photography, these patterns can be quite striking and different from those visible to us. Bjørn Rørslett and Klaus Schmitt have utterly engrossing websites devoted to these images. Interestingly, ultraviolet-only nectar guides are far more prevalent in radially symmetrical flowers than in bilaterally symmetrical flowers, and as far as I can tell, the reason for this is not well understood. Curious if the nasturtiums in the garden looked even more spectacular to hummingbirds and bees than they do to me, I asked Klaus Schmitt if he had any bee-vision ultraviolet images of nasturtiums, and he went out and took some! Nasturtium under visible and UV light. Image copyright Dr. Klaus Schmitt, Weinheim, Germany. True to form, while still beautiful and extra-velvety looking, only very weak ultraviolet patterns are apparent. 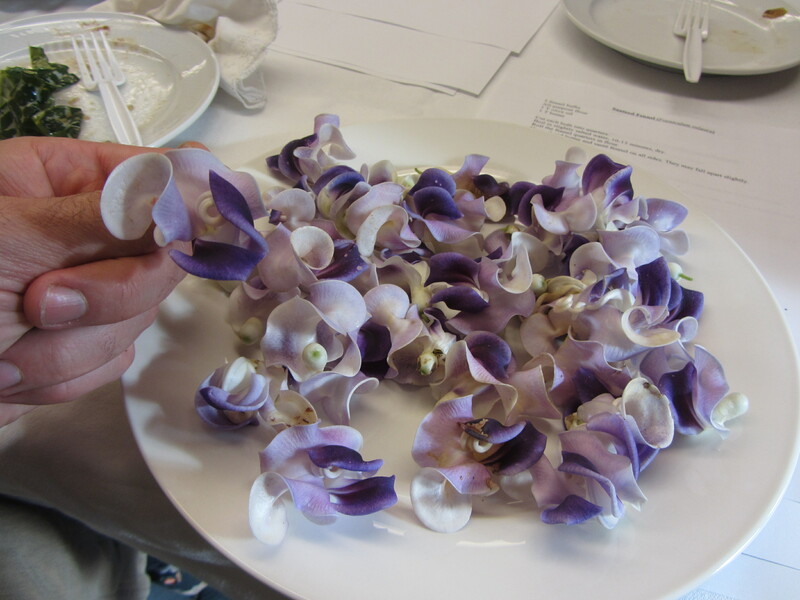 Most of my favorite edible flowers are bilaterally symmetrical: violets, nasturtiums, snail vine (Fabaceae), various mints (sage, basil, thyme, lavender). Next time you see or harvest them in your garden, look for the nectar guides, symmetry, and other adaptations for animal pollination. And toast your pollinators! 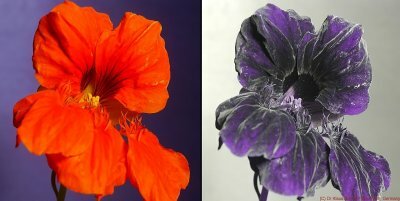 Many special thanks to Klaus Schmitt for taking the nasturtium UV photos and for lending us his amazing flower images for this post. Anderson, A.M. 1977. Parameters determining the attractiveness of stripe patterns in the honey bee. Animal behavior 25: 80-87. Citerne, H., F. Jabbour, S. Nadot, and C. Damerval. 2010. The evolution of floral symmetry. Advances in Botanical Research 54: 85-137. Decraene, L.P.R., and E.F. Smets. 2001. 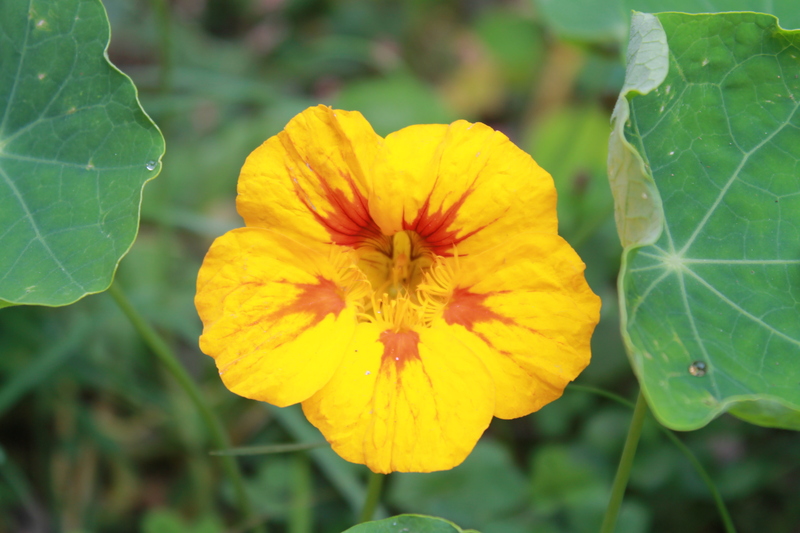 Floral developmental evidence for the systematic relationships of Tropaeolum (Tropaeolaceae). Annals of Botany 88: 879-892. Hainsworth, F.R, and L.L. Wolf. 1976. Nectar characteristics and food selection by hummingbirds. Oecologia 25: 101-113. Neal, P.R., A. Dafni, and M. Giurfa. 1998. Floral symmetry and its role I plant-pollinator systems: Terminology, distribution, and hypotheses. Annual Reviews of Ecology and Systematics 29: 345-373. Osorio, D., and M. Vorobyev. 2008. A review of the evolution of animal colour vision and visual communication signals. Vision Research 48: 2042-2051. This entry was posted in Flavor, herbs, The basics, Uncategorized and tagged Brassicales, flower, Jeanne L. D. Osnas, Nasturtium, nectar guide, pollination, symmetry, Tropaeolum, ultraviolet, zygomorphy. Bookmark the permalink. (sigh) Beautiful as always. Thanks for taking the time. Your blog is really REALLY interesting – I read a lot of cooking and kitchen and recipe blogs. I really love the more “scientific background” feel of what you write. Thanks! I also love your articles, but I’m pretty sure bees (at least, apis mellifera, honeybees) must be able to metabolize sucrose. I have two hives, and a common way to feed the bees is with syrup made by dissolving white table sugar in water. I don’t think that causes the sugars to convert to fructose and/or glucose, does it? Good catch, Pat. I’ve deleted the sentence in the post that erroneously accused bees of avoiding sucrose. I’m frustrated about this, though, because I am sure I read that in one of the papers I read for this post, but going back through it now, I can’t find the sentence, but I’m finding lots of evidence that bees do just fine on sucrose. Weird. And thanks!